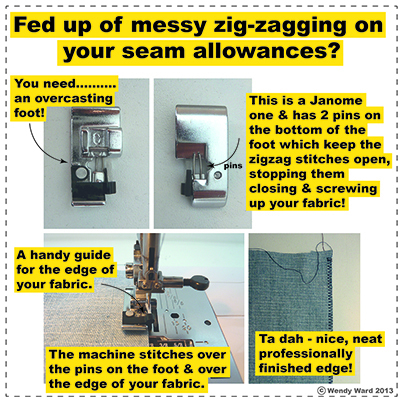 Do you struggle with getting neatly finished seam allowances?? Try this…. The overcasting foot is also sometimes called an “overlock foot”. They don’t often come as standard with a new machine (although they do with new Janomes and some Berninas), but you can buy them as an extra attachment for your machine and they’re well worth it. Once you’ve used one and seen the results you’ll never want to be without it. 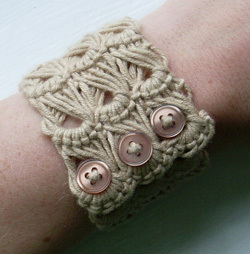 They’re a great alternative if you don’t have an overlocker, giving an almost as neat finish. You can also use them with your machine’s other recommended ”overcasting” or edge neatening stitches as well as just the standard zigzag stitch. If you’re going to invest in one, be sure you buy the correct one for your make and model of machine, an incorrect one can lead to broken needles, tangled threads and tears! If you can’t buy or order one from your local friendly sewing machine shop, have a look online – do a search using overcasting foot (or overlocking foot) + the make and model of your sewing machine and you should come up with some results, they’re usually between £10 – £15.